Objectives The importance of Cardiac Implant Registry (CIR) for ensuring a long-term follow-up in postmarket surveillance has been recognised and approved, but there is lack of consensus standards on how to establish a CIR. The aim of this study is to investigate the structure and key elements of CIRs in the past decade (2006–2016) and to provide recommendations on ‘best practice’ approaches. Settings and participants A systematic search on CIR was employed in line with the Preferred Reporting Items for Systematic Reviews and Meta-Analyses guidelines. The following databases were searched: the PubMed (Medline), ScienceDirect and the Scopus database, EMBASE. After identifying the existing CIRs, an aggregative approach will be used to explore key elements emerging in the identified registries. Results The following 82 registries were identified: 18 implantable cardioverterdefibrillator (ICD) registries, 7 cardiac resynchronisation therapy (CRT) registries, 5 pacemaker registries and 6 cardiovascular implantable electronic device registries which combined ICD, pacemaker and CRT implantation data; as well as 22 coronary stent registries and 24 transcatheteraortic heart valve implantation registries. While 71 national or local registries are from a single country, 44 are from European countries and 9 are located in USA. The following criteria have been summarised from the identified registries, including: registry working group, ethic issues, transparency, research objective, inclusion criteria, compulsory participation, endpoint, sample size, data collection basement, data collection methods, data entry, data validation and statistical analysis. Conclusions Registries provide a ‘real-world’ picture for patients, physicians, manufacturers, payers, decision-makers and other stakeholders. CIRs are important for regulatory decisions concerning the safety and therefore approval issues of the medical device; for payers CIRs provide evidence on the medical device benefit and drive the decision whether the product should be reimbursed or not; for hospitals CIRs’ data are important for sound procurement decisions, and CIRs also help patients and their physicians to joint decision-making which of the products is the most appropriate. This study is the first review summarising global practice experience of the structure and key elements of the cardiac implant registries. Strength of the study is the identification of 14 key elements for designing and planning a cardiac implant registry, based on the experiences from 82 different registries. General limitation of a systematic review is due to the language limits, not all of the registries have been included in the review, which might cause missing data. As high-risk devices, cardiac implants have specific characteristics and thus registries have to reflect their requirements. Cardiac implant registries belong to the group of product registries, which aim to investigate the performance and impact of a product in a ‘real-world’ setting.8 It is different from the patient registry’s objective, which focuses on the severity and duration of the disease.8 Cardiac implants have different types of products. One specific category is based on using a battery inside called cardiovascular implantable electronic device (CIED) including implantable cardioverter defibrillator (ICD), pacemaker and cardiac resynchronisation therapy (CRT); the other category does not need a battery to support including coronary stents and transcatheter aortic heart valve implantation (TAVI). Although there are several cardiac implant registries worldwide,9 10 there is still a lack of consensus about standards on how to design a cardiac implant registry (CIR). What elements should be included to design a CIR? For different type of CIR, what should be noticed when performing each element? Questions like these to design a CIR need to be answered. The aim of this study is to investigate the global structure and key elements of the cardiac implant registries, through an overview of existing cardiac implant registries worldwide in the past decade (2006–2016), and to provide recommendations on how to solve the problems arising from designing and planning a registry. The titles and abstracts of all retrieved articles were reviewed by two researchers (SZ and PLK-R) independently after removing the duplicated studies. If two researchers had discrepancies, the article was discussed within an internal panel of members of the leading edge cluster Medical Valley. After identifying all the relevant articles, the researchers summarised them based on the same name of the registry. From those articles published by one single registry, the most recent or most significant article regarding the registry design has been chosen. The quality of observational studies included in our review was appraised by Newcastle-Ottawa Scale (selection, comparability and outcome) criteria.13 According to the criteria described by Niederläender et al,14 articles are included in the review if they precisely describe the design process of a CIR. The publications were excluded if they were a single-clinical study but with the registry name. Inclusion criteria and exclusion criteria for this review were listed in table 1. To identify the key elements of registry design, the researchers aggregated findings which are relevant to the design of a CIR from each identified publication, based on ‘Aggregative approaches to synthesis’ described by Gough.15 The researchers took each element from identified articles which are relevant to the design of a CIR. The quality of key elements was assessed based on the criteria described by Niederläender et al.14 This step has been done by two researchers (SZ and PLK-R) independently. We assessed the possibility of publication bias both visually and formally to check if the publication contains description of each element for designing a CIR. This review identified 1529 studies that were potentially relevant. Of all these studies, 406 originated from the PubMed (Medline) database, 344 from the Scopus database and 251 from the ScienceDirect, as well as 528 from the EMBASE. After removing duplicates, 624 abstracts have been reviewed by two researchers independently. Four hundred and thirty-eight articles have been put into full-text review afterwards. Four hundred and sixteen articles were actually relevant and then included in the review. Among them, 217 were related to an ICD registry, 13 were a CRT registry, 29 were about a pacemaker registry, 76 were from a coronary stent registry and 81 were from a TAVI registry. 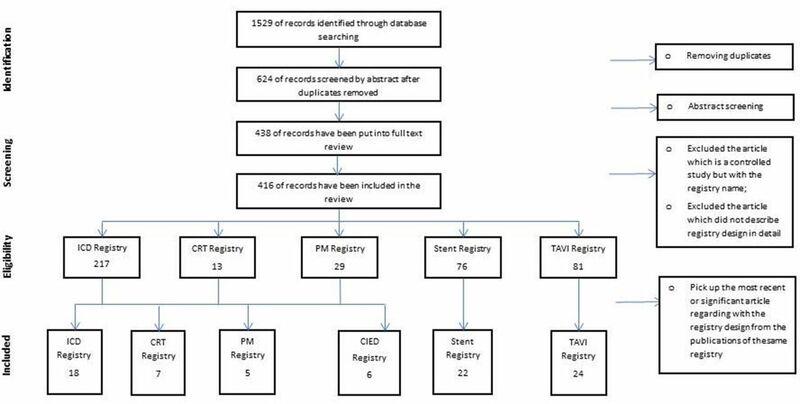 To summarise the cardiac implant registries from the identified articles, 82 registries were achieved, which is shown in figure 1. Detailed information of full electronic search strategy for each database can be found in online supplementary additional file 1. Preferred Reporting Items for Systematic Reviews and Meta-Analyses flow diagram of study selection. CRT, cardiac resynchronisation therapy; CIED, cardiovascular implantable electronic device; ICD, implantable cardioverter defibrillator; PM, pacemaker; TAVI, transcatheter aortic heart valve implantation. Figure 2 shows the distributions of global cardiac implant registries. Table 2 provides an overview of the identified cardiac registries, among all of 82 identified registries, 35 registries are ongoing registries. Specific information about the key elements of registries can be found in online supplementary additional file 2. Location of identified cardiac implant registries. CRT, cardiac resynchronisation therapy; CIED, cardiovascular implantable electronic device; ICD, implantable cardioverter defibrillator; PM, pacemaker; TAVI, transcatheter aortic heart valve implantation. An overview of cardiac implant registries in the last decade In multicentre, International-level multicentre; N multicentre, National-level multicentre. A systematic ‘Aggregative approaches to synthesis’ described by Gough was used to collect key elements arising from identified cardiac implant registries. The results were illustrated in following text. Specific information about key elements of registry design can be found in online supplementary additional file 2. Most registries were based on a clear research objective. Different kinds of research objectives can be summarised as follows: 24 registries aimed to provide a record of clinical status of the devices; 17 registries investigated safety and performance of the devices, with most of them being stent registries. Moreover, five registries examined the frequency of complications and their predictors after implantation; four registries predicted all-cause mortality of patients after implantation, most of them are CRT registries and 10 registries compared the effects of devices from different manufactures or from different procedures, most of them are TAVI registries. Based on patients’ willingness to participate, it differentiates into volunteer registry and compulsory registry. Five identified registries are compulsory registries, which have a mandatory requirement for all patients in a defined region with identified implanted device to participant.19–23 Of all 82 identified registries, four registries reported tracking patients with a unique identifier. Funding support is crucial for registries. Out of all 82 registries, 26 are funded by public organisations, which include cardiology societies, foundations or research institutes; five are financed by their local or national governments. Seventeen are funded by manufacturers, and two registries are funded by public organisations and manufacturers cooperatively. All registries are cooperating with a health department. For a well-designed registry, a steering committee is necessary. The steering committees are responsible for defining the strategies, supervising the annual report and encouraging health department to participate.24 25 Most identified registries have not provided a comprehensive description of their steering committee. Of all 82 registries identified in our study, 69 registries collected data prospectively, 11 registries conducted a retrospective study and 2 studies conducted a prospective study also included data retrospectively. A registry can collect data from single centre or from multicentre. As shown in table 2, of all 82 identified registries, 30 are national-level multicentre registries, 5 are international-level multicentre registries and 16 are single-centre registries, the rest are regional multicentre registries. Different types of registries have different clinical endpoint definitions. Major endpoints can be categorised as device-related outcomes and clinical outcomes. The TAVI registries defined an endpoint according to recommendations of the Valve Academic Research Consortium (VARC) or VARC-2, which is a standardised endpoint definition for TAVI.27 28 There is also clinical endpoint for coronary stent trials from Academic Research Consortium.29 However, endpoints for the CIED registry are inconsistently reported. The data have been collected either from medical records or from questionnaires. For the CIED, transmitters are able to interrogate to most of the devices, and then download data from the device, which also can support data collection and data entry. After preparing a questionnaire, there are two ways to fill out the questionnaire: either patients fill out the questionnaires by themselves with a hard copy or via an online system; or medical staffs fill out the questionnaires according to a telephone interview or a face-to-face interview. Most registries have a secure, web-based or a computer-based reporting system. For the single-centre registry, data entry is conducted by a trained nurse or fixed person in the working group. For the multicentre registries, participating centres entry the data into the system directly or send the data to the registry working group. Different methods have been found to ensure the data accuracy. The registry can check the data randomly, and assess the data by regular review, similar to an annual report. If the registry collects the data from a multicentre, each participating centre can confirm the data first, and then an independent working group in the registry can review the data again. In addition, the registry can assess if the data are complete by comparing the registry data with the manufactures’ data. Of all 82 identified cardiac implant registries, six registries can be accessed via a web page, along with an annual report. The other 76 registries neither have a web-site available to the public nor an annual report. These registries can be only identified via the publications, these publications provide clinical outcomes but limited information on registry design. To the best of our knowledge, our study is the first study to review the existing global cardiac implant registries and their practices as well as experiences. This manuscript introduces the structure and key elements, which can be seen as the first step of guidance on designing a CIR in the future and making them more appropriate for public health decision-makers as well as transparent to patients and other stakeholders. This review identified 82 cardiac implant registries from 28 countries or regions in the past decade. From these 82 registries, 9 categories with 14 key elements have been identified and illustrated in detail. The following text illustrates the recommendations and concerns arising from planning and designing a CIR. The primary focus of cardiac implant registries is product’s safety and effectiveness. As a high-risk medical device registry, the authors summarised the following aspects needed to be noticed in the process of designing a CIR. Adverse event reporting should be considered and discussed as a major focal point when planning a CIR. In addition, the registry should be capable of providing systematic follow-up event data. In our study, most of the registries summarised the event data in their publications or annual report. Being a product which is placed in human body, cardiac implants have their own configurations nature and characteristics. One important area requiring attention is product generation and battery replacement. In this context, battery problems are the most frequent reasons for recalls and replacement of cardiac implants.2 34 Second, device technologies change more rapidly within a shorter time span compared with drug products.35 This rapid change demands that researchers record the product brand and specifications model within registries. Implantation devices and their providers should be described in the registry and considered when analysing data. The release of a free annual report and the accessibility on a website are the most significant strategies for disseminating registries’ results.3 However, the result from our study demonstrated that there is still room for improvement. Seventy-four (90.2%) registries can be only identified through their publications. Data accessibility does not mean open access to the entire patient’s data. Data accessibility is a way to give patients the opportunity to access information directly relevant to their condition. Since the CIR aims to prevent adverse events, accessibility and transparency is vital to both researchers and the public. Many registries are only accessible to the sponsoring organisations. To improve public health and patient care; registry findings should be available and accessible for all stakeholders.36 In an ideal setting, the communication between patients and physicians should be based on registry data. Therefore, a personalised treatment can be delivered. The main limitation of this study is that the authors are only available to search in English, so other existing and well-developed cardiac implant registries have not been included in this review. Although the authors have done a global database search, grey search and hand search, however, it is difficult to assess whether all cardiac implant registries have been identified. The importance of cardiac implants registries has been recognised and approved, but there is lack of consensus standards on how to establish a CIR. Registries provide a ‘real-world’ picture for patients, physicians, manufacturers, payers, decision-makers and other stakeholders. In this context, medical device registries are important for regulatory decisions, concerning the safety and therefore approval issues of the medical device. For payers medical device registries provide evidence on the benefit of the medical device and drive the decision whether the product should be reimbursed or not. For hospitals medical device registries’, data are important for sound procurement decisions, and last—and of paramount importance—medical device registries help patients and their physicians to make joint decision on which product is the most appropriate. World Health Organization. Global atlas of medical devices. Geneva: World Health Organization, 2017. European Commission. Revisions of medical device directives. Luxembourg: European Commission, 2017. CADTH. Grey Matters: a practical tool for searching health-related grey literature. Ottawa: CADTH, 2015.
. Research Methods in Psychology. 3rd edn. Boston & New York: Houghton Mifflin Company, 2002.
. Annual Outcomes With Transcatheter Valve Therapy: From the STS/ACC TVT Registry. Ann Thorac Surg 2016;101:789–800. In: Gliklich RE DN , Leavy MB , eds. Registries for evaluating patient outcomes: a user’s guide [Internet]. 3rd edn. Rockville (MD): Agency for Healthcare Research and Quality (US), 2014. Contributors PLK-R provided substantial contributions to conception and design; SZ drafted the articles with acquisition of data, analysis and interpretation of data; SG revised the manuscript critically for important intellectual content; PLK-R made the final approval of the version to be published. The guarantor is PLK-R.
Funding The research is supported by the German Federal Ministry of Education and Research (BMBF), project grant no: 13EX1013B, as part of the National Leading-Edge Cluster Medical Technologies ‘Medical Valley EMN’. The present work was performed in (partial) fulfilment of the requirements for obtaining the degree “Dr. rer. biol. hum.” at the Medical Faculty of Friedrich-Alexander University of Erlangen-Nürnberg.